The historic Grand’ Place of Brussels is considered to be one of the finest city squares in the world, and it attracts tens of thousands of tourists daily. Many of these outlanders spend plenty of Euros in the businesses established here: high-end shops selling lace and chocolate and other typically Belgian products, cozy cafés where the country’s famous beer flows freely, and restaurants where patrons can feast on immensely popular local specialties such as mussels and frites or the Belgian version of steak tartare, that is, raw beef, for some mysterious reason known here as filet américain. One of these eateries is ensconced in a gorgeous baroque building constructed in 1698. It used to be an extremely expensive luxury restaurant, but has recently morphed into a still sumptuous, but more down-to-earth and affordable “bistro.” Its name is La Maison du Cygne, the “House of the Swan,” and the appellation refers to the sculpted white swan perched proudly above the front door. A plaque outside informs us that it was in this building that the Belgian Workers’ Party (BWP), forerunner of the country’s social-democratic party, known as the Parti Socialiste (PS), was founded in 1885. At that time, there were no tourists anywhere in sight, and Le Cygne was one of many popular taverns on the Grand’ Place where ordinary denizens of Brussels, including proletarian workers, could and did feel at home and, in the case of the increasing number of socialists among them, organize and make plans to overthrow the capitalist system. In fact, Le Cygne had been the haunt of assorted Belgian and international radicals for decades, most emphatically so in the years before and after 1848, when a tsunami of revolutions suddenly swept over much of Europe. 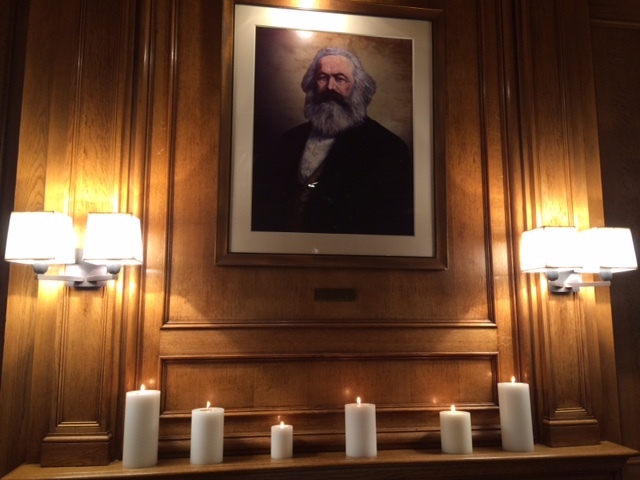 As we enter the bistro’s opulent interior and sit down, we notice the portrait of one of those radicals, Karl Marx, scrutinizing staff and patrons from a kind of shrine illuminated by a row of candles. What is he doing here? Marx was born two hundred years ago, in 1818, in Trier, a picturesque ancient city situated on the vineyard-covered banks of the Moselle River and belonging to the now-defunct German state of Prussia. Because of his radical political views, he had to flee his ultra-conservative country and resided for some time in Paris, but was then kicked out of France. He hung up his hat in Brussels in 1845 and remained there until 1848, when he moved on to London; in the British capital, Marx was to write the magnum opus that would also turn out to be his swan song, so to speak, namely Das Kapital, and he would die there in 1883. The Lilliputian nation of Belgium, founded in 1830 and endowed with one of the most liberal constitutions in Europe, functioned as a tolerant haven for radicals. But it was also a rapidly industrializing country, and a kind of paradise for the bourgeoisie, as Marx himself was to write, a vantage point from which he could observe how capitalists could accumulate fortunes by ruthlessly exploiting the working-class proletariat. His sojourn in Brussels thus turned out to be the most productive time of his life, during which he developed his ideas about dialectical materialism and wrote The Communist Manifesto. This world-famous pamphlet was published – not here but in London – in February 1848, on the eve of the revolution that broke out in Paris later that same month, triggering revolutions in Berlin, Vienna, and many other cities. 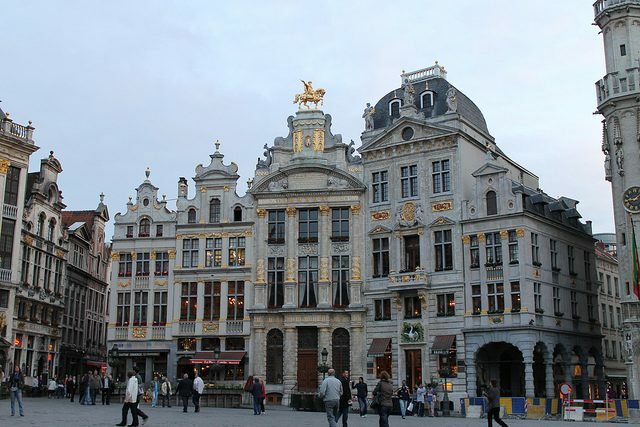 In Brussels, Marx benefited from the city’s location as the hub of a system of newly built railways as well as Belgium’s state-of-the-art postal service. This allowed him to remain in touch with associates in France, Germany, and England, such as Friedrich Engels, who collaborated with him on the project of the Communist Manifesto. Marx, a philosopher who famously urged fellow philosophers not just to interpret, but to change the world, was a frequent guest at Le Cygne. The revolutions of that “wild year” (tolle Jahr, as 1848 came to be known in Germany) did not bring about the realization of his prophesy the demise of capitalism and the advent of socialism. It was only many years later, long after Marx’s death, that capitalism would be overthrown in favour of a socialist system, and far away from Brussels, namely in Russia and, later still, in China, countries associated not with swans but with high-flying eagles and cranes, respectively. Today, Belgium is as bourgeois and committed to capitalism as it was when Marx walked the cobble-stoned alleys and squares of Old Brussels, if not more so; however, having displayed his portrait in a prominent position, the owners and managers of Le Cygne honour the memory of the most famous guest ever to cross their doorstep, even though his presence may shock some of the patrons. A congenial maître d’ of Spanish origin, fluent in English and French as well as his native Castilian, scribbles down our order. Marx remains aloof as we opt for a rather bourgeois appetizer of shrimp croquettes, but pays attention when we ask for Ostend Sole, known outside of Belgium as Dover Sole. He is probably reminded of the time he crossed the English Channel, in whose waters that delicious fish is caught, to move from Brussels to London, thus passing through Ostend as well as Dover. And he seems to like the way my wife and I decide to distribute the wealth, so to speak, by sharing the (expensive) fish – the portions being allotted as he advocated, that is, to “each according to her or his needs.” But when we inquire about a bottle of Chardonnay from the south of France, the great man frowns disapprovingly. True, a crisp Riesling from the Moselle vineyards is so much more appropriate. Maître, a bottle from Bernkastel, that wine village near Trier, por favor! The flask materializes swiftly and is uncorked. Marx smiles approvingly as we raise our glasses, filled with Moselle nectar. Thanks for the tip, Karl!